Before Braeden came along, I thought I was a patient person. More patient than most, actually. Thirteen years of bartending made me patient. Teaching three-year-olds at the one-room schoolhouse tested and boosted my patience bank as well. Extra needs or not, newborns and children in general try our patience. This is how Braeden has been trying mine lately. We get our shoes on to go out to throw rocks. I hold his hand as he proudly descends our eleven steps slowly but, well, slowly. After the stairs, he lets go of my hand because he is a big boy, and he runs to the road with me sprinting after him. "Stop!" I shout. "Take my hand, Braeden. We're at the road." He takes my hand and I kneel down beside him. I turn my head to the left and point. "Are there any cars coming this way?" I ask him as he points a stubby little index finger that way, too. "Nope!" I confirm. I turn my head and point to the right. "Are there any cars coming this way?" He points that little finger to the right. "Nope!" I shout. "Okay, we can cross the road!" Hand in hand, we scurry across. Once we're in the safe zone, he lets go of my hand and sits down. "Braeden. Do you want to go throw rocks?" He puts both hand behind his head and bobs. That means yes. "Okay, then. We have to keep going. Come on, Mister!" He gets up and runs for about twenty feet down the gentle incline of the road. Then he sits down again. I know this is how it's going to go for the rest of the way. On the days when we go straight down two and a half blocks to the beach by the Harbor Haus, I am okay with it. On the days we have to go seven blocks to Jamsen's Bakery so we can get a cheddar bacon scone, I get a little impatient. "Braeden, do you want to go throw rocks with mama?" He knocks his knuckles together several times -- our sign for rocks. "Okay, then. Come on. Let's go!" He stands up without using his hands, so I clap. 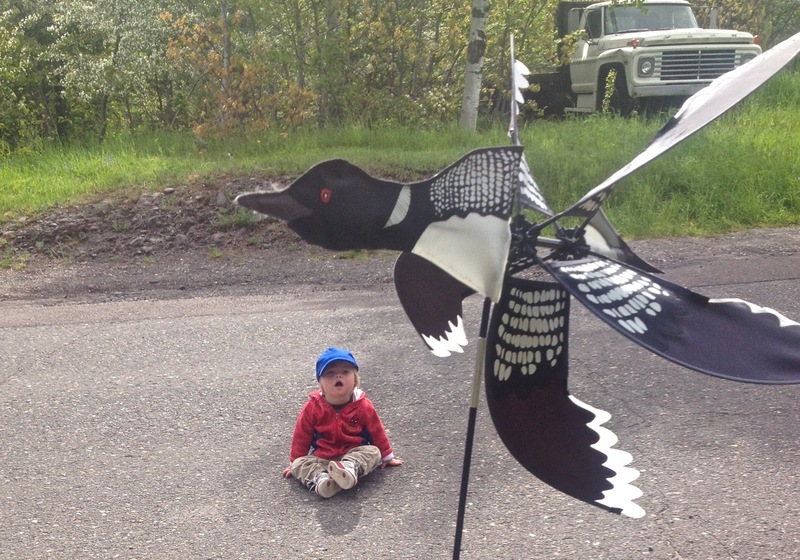 Then he runs another twenty feet until he sees the loon whirlygig spinning in front of the Laughing Loon gift shop. He plops down, staring up at it in awe. 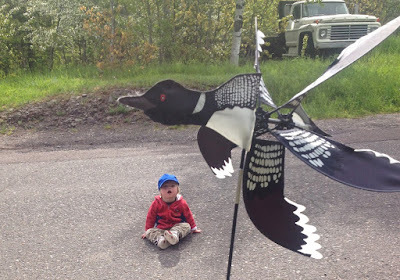 Now I know we're going to be here for a while, so I describe parts of the loon to him. "Here are the loon's wings. They're spinning around! Here is the loon's tail. Here's the loon's beak." Etcetera, etcetera. When my tummy growls, I push it a little. "Okay, bye bye, Loon!" I announce. "Wave good-bye, Braeden." His floppy wrist waves to the loon, and he stands up. He sprints down the road again, but this time I try to keep him upright. "Jump!" I shout, jumping over a crack in the pavement. Braeden jumps when he reaches that crack. "Here's another one. Jump!" And we both jump over. Now I don't want this post to take as long to read as it takes us to get to the bakery, I mean, beach, so we'll just skip to the beach. You get the gist. 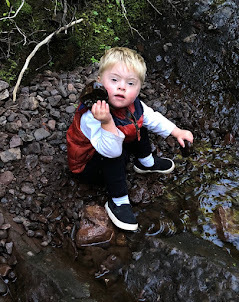 While basking in Lake Superior's glory, we throw rocks and clap and make splooshing sounds. We might see some kayakers, a freighter, a motor boat, an eagle or some ducks. We always see seagulls and crows. We both love to be there. I can tell it's Brady P's happy place. We linger as long as possible, but when I feel it's time to go, I tell him, "Three more rocks, Braed. Then we have to go." He shakes his head, but continues to throw until I count three splooshes. Then I scoop him up and we turn around to stare at the lake and blow her a kiss. Braeden is a good kiss-blower. "Thank you, beautiful lake," I sing while we both wave. "See you next time!" Off we go for a trek back up the hill. This will take half an hour, too, especially if we pass puddles or the spray-painted culvert sites with the neon numbers. Then he has to point to each number a hundred times while I tell him which number it is. But if I am lucky, he will let me carry him the rest of the way home. What a beautiful place to live. We'll be back for two weeks...Not long enough. So happy you can enjoy the north woods.